My name is Karina and I was born in a cross-cultural family. My mother is Ukrainian and my father is Slovenian. While singing lullabies, my mother instilled boundless love to Ukraine and all Ukrainian in me. I started speaking Ukrainian in the age of five! I am a very active Ukrainian and I participate in many musical, song festivals and art competitions both in Europe and Ukraine. I always help my mother, because she is the head of Union of Ukrainians “Beregynia” in Slovenia. My ancestors on my mother’s side are very pro-Ukrainian. As far as I can remember, my grandmother fought for Ukraine and its people. Also, she was a member of Organization of Ukrainian Nationalists (OUN). You can read about my granny in the book Ukrainian Women in the Liberation Struggle in the 1940s and 1950s. I drew my painting for no particular reason, as I felt it, just in one sitting. Only afterwards people told me about their feelings and said what they saw – a little Ukrainian girl as if a young state is proudly holding the dear blue-and-yellow fl ag. It unites all faithful sons and daughters of the country, which is now the heart of Europe as an island in the center of a big lake. 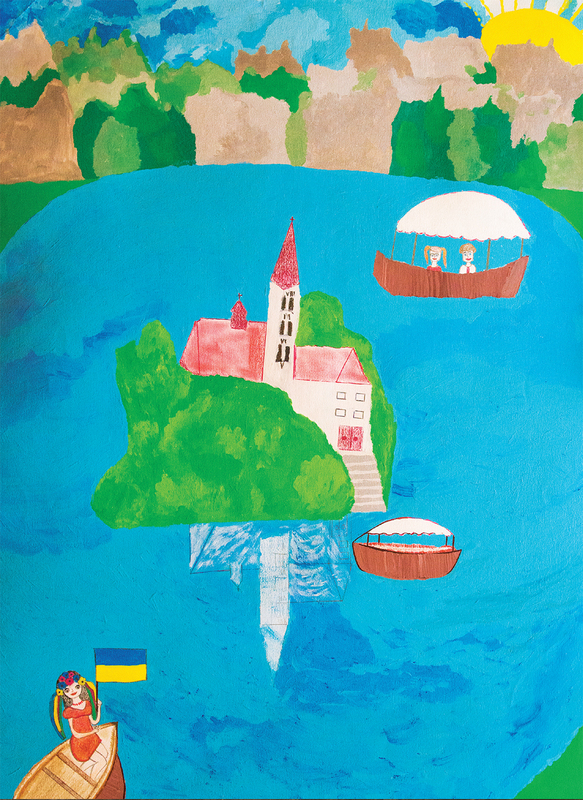 The sun of the Future has risen over Ukraine; it shines and encourages the Ukrainian girl to steer its boat toward light with trust in God and belief in a better future for Ukrainians.